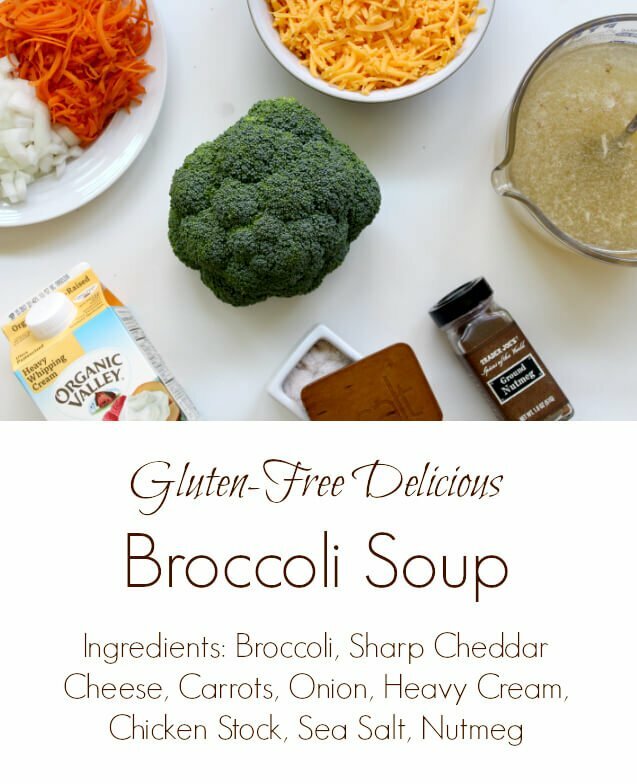 Rich, creamy, and full of vegetables and flavor- this Gluten-Free Broccoli Cheese Soup is everything you want in a soup this fall and winter. Rather than make a traditional roux with flour and butter, we opt instead to saute onions until fragrant and soft- this helps thicken the soup. After the onions, we add carrots, broccoli pieces, nourishing chicken stock, the secret ingredient that pulls it all together (nutmeg!) and finally heavy cream and sharp cheddar cheese. The result is a delicious hearty soup that is a change of pace from broth-based soups, yet still incorporates nutrient-dense broth. Note on Instant Pot: (Not sure what the Instant Pot is? 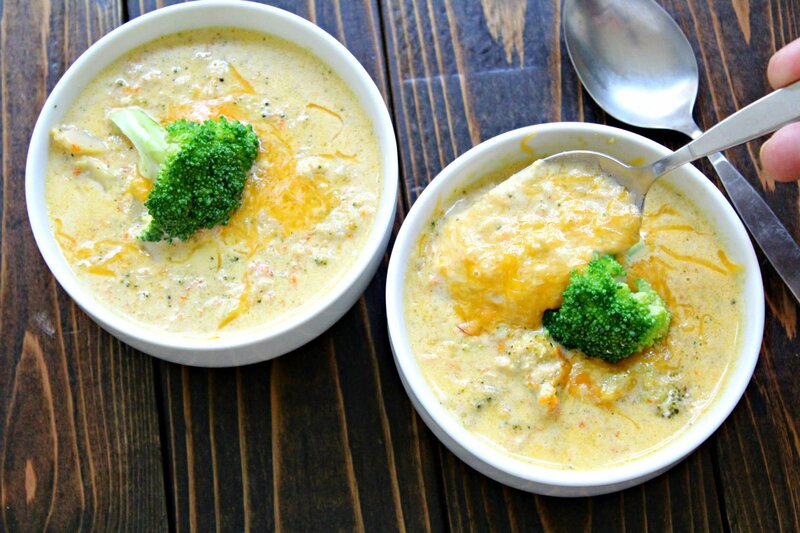 Read more here ) The broccoli cooks relatively quickly in this soup, with the entire thing coming together in 30 minutes. Using the pressure setting on your Instant Pot won’t save any time, though you can use the saute function if you’d like to free up your stovetop for other things. I use my Instant Pot in this way often, as the pot is easier to wash and fits in my dishwasher better than my large stock pots. Thick, hearty, creamy, and with the sharp tang of cheddar cheese, this soup is sure to be a hit. In the bottom of a stock pot, melt butter over medium heat and add onion once chopped. Saute onions until edges start to brown and onions are soft. Add cream, chicken stock, chopped broccoli, and carrot, keeping on medium heat. Once the soup is simmering, lower heat to medium-low (or low on the Instant Pot Saute Function) and cook an additional 20 minutes, or until broccoli is soft. Add nutmeg, salt, and pepper and use an immersion blender (or process a few batches through a regular blender and pour them back in) to puree the soup to desired consistency. The more you puree it, the thicker it will be. I like to leave some chunks for texture, but have it mostly smooth and creamy. Stir in grated cheddar cheese, reserving a little to top the bowls of soup with as garnish. Serve immediately. *Take care not to reheat to a boil after adding the cheese or the cheese will break down and the texture will be unappetizing. GAPS Notes: Technically fresh whole cream is not allowed on the GAPS diet, but it is one of the first things that you can eat coming off GAPS. 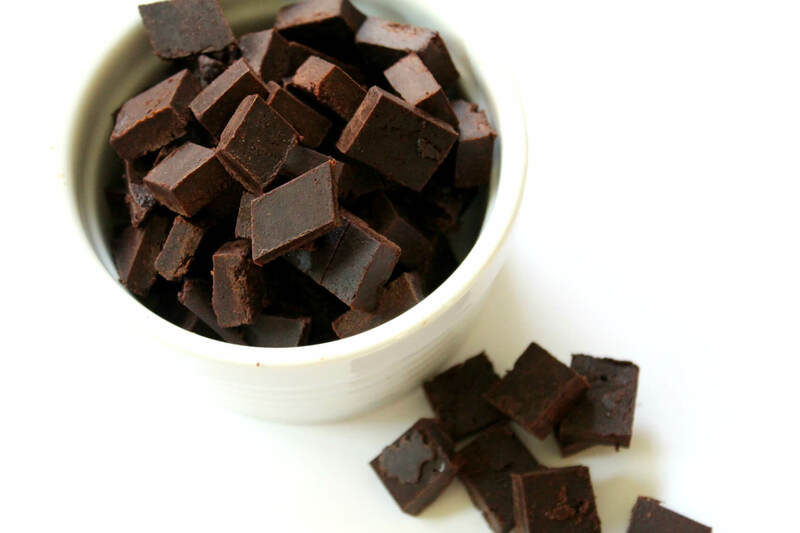 If you’d like, you can substitute full fat coconut milk, but it will change the flavor a bit. 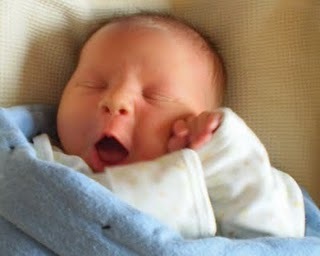 Additionally, you can culture your cream with kefir for 24 hours and that will use up the rest of the lactose. 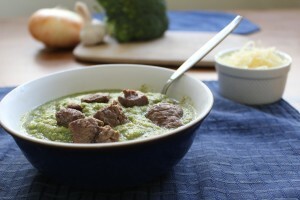 If you are dairy free, you will love this hearty dairy-free broccoli beef soup.